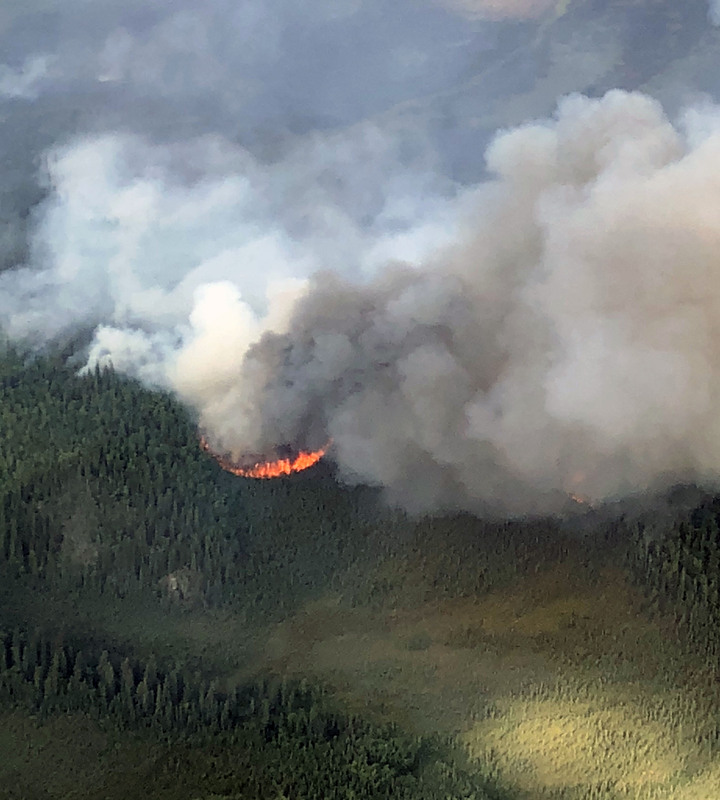 The Taixtsalda Hill Fire (#357) burning southeast of Tok continued to grow on Friday due to hot, dry conditions and is now estimated at 15,000 acres, an increase of approximately 2,000 acres from Friday. Most of the new growth on Friday occurred on the north end of the fire as the result of a 1-mile run the fire made in that direction in the afternoon. Given the current hot, dry weather conditions, the fire has the potential to grow in any direction, depending on wind direction. 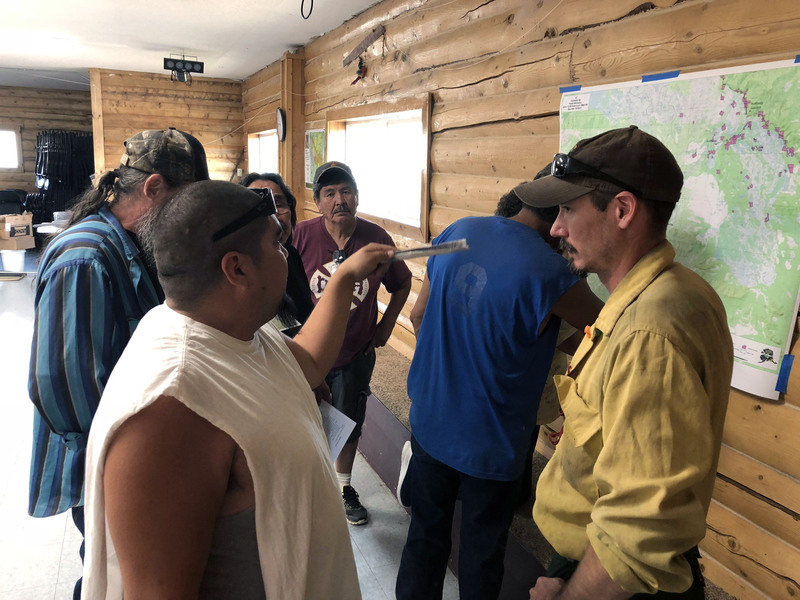 Fire managers are developing strategies to address the potential for the fire moving closer to the communities of Northway and Tetlin, both of which are approximately 15 miles from the fire. Northway is to the northeast and Tetlin is to the northwest. Suppression efforts by the 137 firefighters working on the incident are focused on protecting property, such as Native allotments and cabins. Two helicopters are supporting the four Type 2 crews assigned to the fire, which is being managed by the Alaska Division of Forestry. On Friday, firefighters staffed two additional Native allotments to begin cutting saw line and laying hose around them. A test burn for a burnout operation to remove fuel and widen containment lines around one allotment was conducted but was not successful due to weather changes in the afternoon that produced higher relative humidities. Burnout operations around allotments are still a possibility, if conditions allow. Fire managers are continuing to assess and inventory allotments and other values that may be threatened by the fire. Management action points have been identified in multiple directions to dictate a plan of action should the fire reach those points. Travelers on the Alaska Highway can see smoke from the fire but the smoke is not impacting the highway. The fire remains approximately 20 miles west of the highway. A community meeting was held in the village of Northway on Friday evening to provide local residents information about the fire. Approximately 35 residents attended the meeting. Another community meeting is scheduled for 3 p.m. today in Tok at Fast Eddy’s restaurant. A Temporary Flight Restriction (TFR) remains in place over the fire to provide a safe environment for multiple firefighting aircraft that are flying in the area. To check on the specific coordinates of the TFR, pilots can go to http://tfr.faa.gov/save_pages/detail_8_5595.html.